It’s over 100 years since E M Forster wrote “The Machine Stops”. If you haven’t read it I suggest you give it a go. After you have you won’t worry too much about the slight delay to the publication of this post in Pete Sixsmith’s “First Time ” series. You might, however, worry about the prevalence of the gremlins that stopped it reaching us. 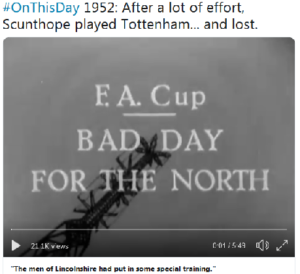 And we roll on to North Lincolnshire to the home of what was Scunthorpe and Lindsey United, the name that they had when they came into the Football League in 1950, alongside Gillingham, Workington and Shrewsbury Town. Of the four, they have arguably, been the most successful, having racked up nine seasons at the second level and not having dropped out of the Football League since they were voted in. Gillingham have also retained FL membership for that period, while Shrewsbury had a long run in the second tier but also slipped into what was then the Conference for a season in the early years of this century. As for Workington, they are in serious danger of slipping into the Northern Premier League First Division for next season. So, Scunthorpe have been pretty solid Football League members. They originally played at The Old Show Ground, a town centre stadium that boasted the first cantilever stand in the UK and moved to Glanford Park, on the edge of the town, in 1988. 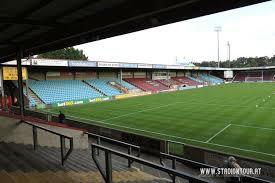 Thirty years on, it is showing its age and there was serious talk of a new ground and accompanying retail/leisure complex, but this fell through in 2017 and the club have stated that they intend to develop Glanford Park and raise the capacity from 9,000 to 12,000. They could have done with the extra seats for Saturday. 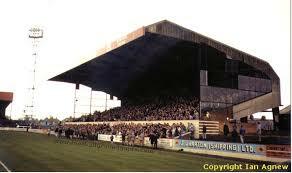 We have played here twice, both pre-season friendlies. I saw them both. I also saw The Iron beat Bedlington Terriers (remember them!!) 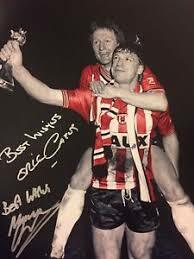 in the FA Cup in 1988. I saw that one from the posh seats. 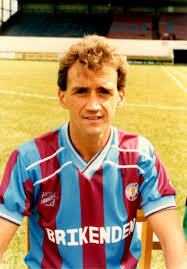 My first visit to Glanford Park was on the 8th August 1992, when we were still basking in the (relative) glory of reaching the previous season’s FA Cup Final. 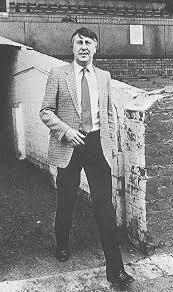 Malcolm Crosby was the manager and had been busy in the transfer market. Paul Hardyman had left after being omitted for the game against Liverpool and he had brought in three players who he hoped would push us on to promotion. Shaun Cunnington and John Colquhoun hardly set Wearside on fire – although my pal Jeremy Robson was able to turn his considerable talent for invective on poor Cunnington. 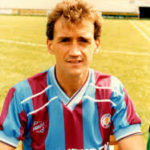 The third signing was Terry Butcher, who eventually usurped Crosby as manager and ranks as one of the weakest managers in the club’s history. The optimism was clearly misplaced. Mark Samways; Joe Joyce, Paul Longden, David Hill, Matt Elliott, Glen Humphries, Dean Martin, Jerry Lewis… sorry, Graham Alexander, Tony Daws, John Buckley, Ian Helliwell. There were some good players in that Iron line up. Matt Elliott moved on to Oxford United and then Leicester City, becoming an important figure for the Filberts under Martin O’Neill, while Graham Alexander dotted about before becoming a manager at Scunthorpe, Fleetwood and currently, Salford City. I drove down in my Fiat Tipo, taking a couple of lads from King James Youth Club with me – shout out for Shaun Hunter and Ross Hardaker, both good lads and both in their 40s now. Makes me feel ancient. The presence of the FA Cup runners up did not attract many to Glanford Park, with a crowd of 1,455 scattered around the (relatively) new stands. For a new stadium, it was not very inspiring and made those of us who accepted that a move from Roker was inevitable, fear for whatever we might end up in. Colquhoun had his finest moment in a Sunderland shirt when he opened the scoring in the 38th minute, but Butcher failed to organise his disparate defenders and Alexander and Hill put Scunny ahead in the second half. 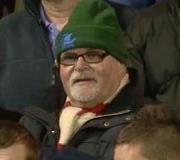 It took a late equaliser from John Byrne, already looking less than interested, to spare our blushes and start an unbeaten First Team record for me at Glanford. This was followed by a 0-0 draw at the start of last season with Robbin Ruiter making an encouraging second appearance and there was a smidgeon of hope that Simon Grayson was beginning to put a team together that would consolidate in the Championship. Huh!!! We have not won a league game in this part of Lincolnshire, our record reading 3 draws and 3 defeats. We won an FA Cup replay at The Old Show Ground in 1953, thanks to goals from Tommy Wright and Trevor Ford, but we lost an FA Cup tie on my sole visit to TOSG in December 1987 when we lost 2-1 to a Scunthorpe side managed by Sunderland fan and subsequent manager, Mick Buxton. I travelled with the excellent Doug Bones and the late and much missed Steven Wilson, on George Michael Thompson’s bus, complete with crates of beer and funnel through the front door. The Old Show Ground was close to the town centre and pubs were sought out and occupied. 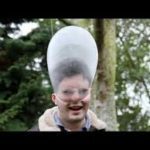 It was in one of them where I witnessed a craze that was sweeping the nation in those pre-YouTube days viz the condom blow up. We were easily pleased thirty years ago…. It was a wet and murky day. Under Dennis Smith, we were looking good in the league and a cup run was anticipated. Darlington had been seen off at Roker in the previous round and Scunthorpe, as divisional colleagues of the Quakers, were seen as a team that we could beat. Ron Green; Billy Russell, Paul Langdon, Kevin Tayloe, Steve Lister, Richard Money (right, current Hartlepool United manager), David Harle, Steve Johnson, Andy Flowers, Mark Atkins subs; Andy Stevenson, Tony Daws both unused. When Gatesy opened the scoring in the 22nd minute, we sat back (metaphorically) and expected Marco to follow suit and Scunthorpe to fade away. I was able to peruse the cantilever stand from a distance and admired its sleek and modernistic lines and saw this as the future of stadia in this country. Not as big as the ones at Hillsborough and Old Trafford, but impressive nonetheless – and certainly an improvement on the cow sheds that covered the rest of the ground. The goals did not flow – or at least not for us. Kevin Taylor levelled in the 57th minute and twelve minutes later, David Harle slotted in what turned out to be the winner. Even the arrival of Keith Bertschin for a tiring Gates, failed to earn us a replay at Roker. In August, Scunthorpe turned up at the Stadium and perfectly played the part of lambs to the slaughter. They quickly found themselves 3 down with goals from Max Power, Josh Maja and Chris Maguire and we could have scored more. Manager Nick Daws left soon afterwards and was replaced by former Bradford City boss Stuart McCall, who has engineered a change and lifted The Iron away from the relegation zone. 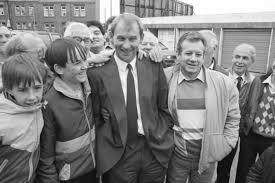 We need to reverse the score from that grim, grey day in 1987 and get back on track for automatic promotion. This will prove to be a good test for us – here’s hoping that we can come through it. Another enjoyable article, Sixer. The Spurs footage is well worth a watch too. Did he say 52,000 ? 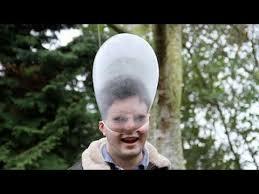 Just hope Scunny aren’t still doing their “special training” – we’d have no chance. F A cup magic. Times may change but the quality writing from Sixer remains. Thank you. Another excellent piece from Sixer coupled with the Scunthorpe vs Spurs commentary. What was really noticeable for me was the almost “stilted” way in which they all spoke, unlike nowadays.